UCX Token Sales Terms, Products, User Guide Page. Market price of Ethereum(ETH) : The closing price of the previous day (at 8:59:59 a.m. of the day) based on the ‘Upbit Exchange’. USD exchange rate and market price of Ethereum(ETH) is based on Korean time. » Approximately at 10:00 a.m. on the same business day, the USD exchange rate (closing basic rate of exchange of the previous business day of the ‘KEB Hana Bank’) and the Ethereum(ETH) closing price (the closing price of the previous day (at 8:59:59 a.m. of the day) based on the ‘Upbit Exchange’.) will be disclosed at the top of the information page. We do not post USD exchange rate and market price on weekends and holidays on our website. But for the Ethereum(ETH), We will apply the closing price of the previous day on the day of deposit. And the USD exchange rate applies to last working business day’s closing, we use rates of the ‘KEB Hana Bank’ before the start of any weekends and holidays. USD exchange rate and market price of Ethereum(ETH) is based on Korean time. UCX Token Payment: In case of 1Ethereum deposit, you will receive 241UCX Tokens. 1UCX Token is approximately 0.0042Ethereum(ETH). The closing price of the previous day (at 8:59:59 a.m. of the day) based on the ‘Upbit Exchange’. $1USD = 1,124KRW. The USD exchange rate is calculated from final foreign exchange (USD/KRW) closing basic rate of ‘KEB Hana Bank’. If you convert 1Ethereum(ETH) at the price of $120.24USD to the 1UCX Token price of $0.50USD, 1Ethereum(ETH) is equivalent to 240.48UCX Tokens. Therefore, a total of 241UCX Tokens would be transferred (1UCX Token will be added when the decimal point is generated). » The minimum purchase amount for UCX Token is 1Ethereum(ETH). Access the UCX site. Please run your Chrome browser. 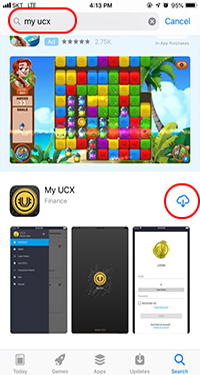 If you want to use mobile app, please install the “My UCX” app at the link below. 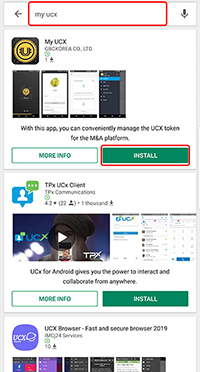 To download UCX onto your mobile app, please search “my ucx” on Google Play Store or App Store. Click the “Create an account” link on the login screen, and then proceed the registration process. Among input values into member subscription page, “User Name” means your personal ID and “Password,” it must contain 8 characters with case letters, lower case letters, numbers and special characters. Please read and if you agree with the terms and conditions of service then please check on “I read and accept” box. 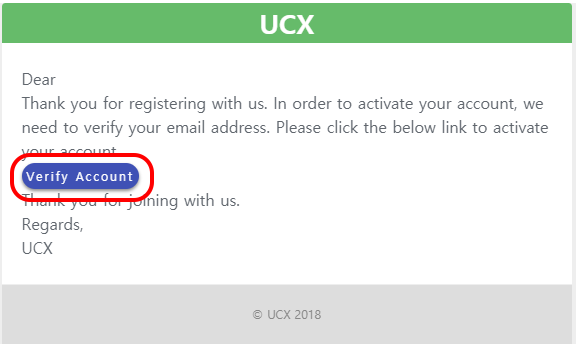 When you click the “Create an account” button to complete the membership subscription, “UCX: Email Activation” an email will be sent to your email account which you registered during membership subscription, and click “Verify Account” button to complete the e-mail authentication. 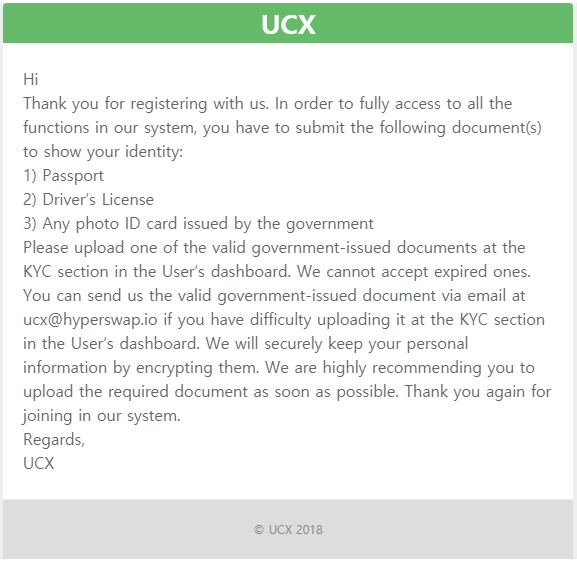 Please confirm the information e-mail, “UCX: Process for Uploading KYC (Know Your Customer)”, to prevent any financial malpractice, please confirm from the e-mail address that was used during your initial registration process.. 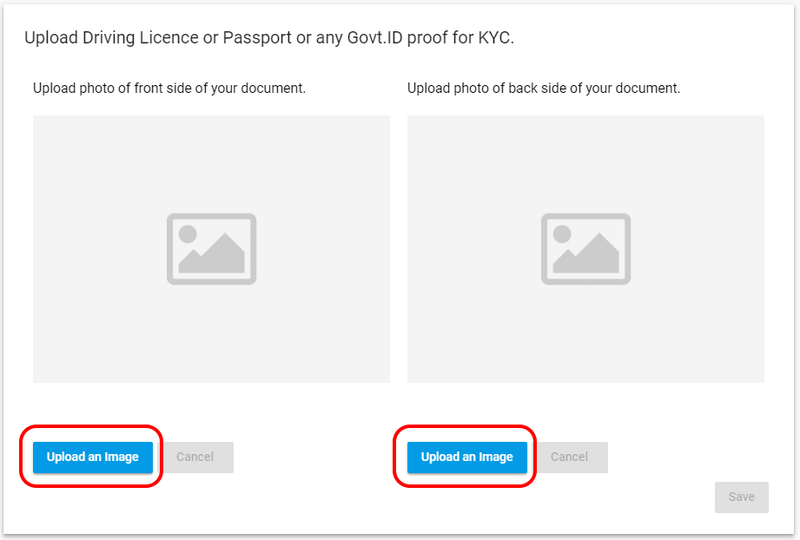 Please access to “Your KYC’s” on the left menu in the UCX site, and select and download either a passport, driver’s license or any government issued ID’s for KYC (Know Your Customer) / AML (Anti-Money Laundering) , then upload the front and back copies of above mentioned identifications to register for KYC. * You should not send it directly from the exchange. You would not be able to receive purchased Token, when you transfer it from the exchange. * Please double check and enter the exact wallet address. Once the Tokens are sent they cannot be reversed. 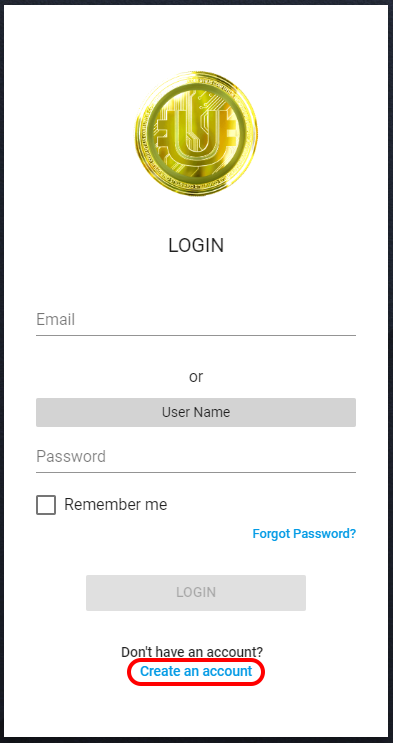 * Please enter your wallet address which Ethereum(ETH) was sent from, in that wallet you should have a “receive” address for receiving our UCX Tokens. If all information’s for KYC (Know Your Customer) were inputted correctly, the process may take up to 3 working days and to confirmed deposit (transfer) to the Hyperswap wallet address. During that time, you should receive an e-mail with the contents of purchased UCX Token. And for any reasons, if your KYC (Know Your Customer) requires further information, an e-mail should be sent to you requesting additional information to complete the process. Please access “Dashboard” on the left menu in the UCX site to confirm the sent UCX Token. 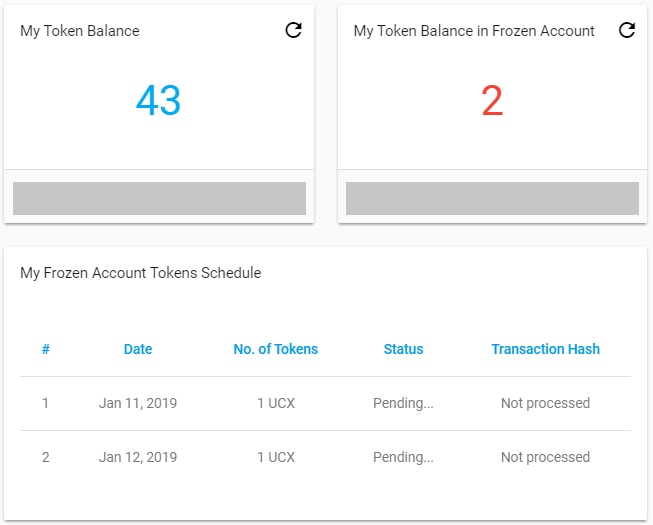 * My Token Balance” means the UCX Token possessed by the registered wallet, and “My Token Balance in Frozen Account” means the locked UCX Token, which means own UCX Token that cannot be used for a certain period of time, and the timing and number of Token to be sent is available to be checked through the date column & No., of Tokens in “My Frozen Account Tokens Schedule”. Please check the terms and conditions for purchasing UCX. Q. What is Token sale? A. It is a new type of funding method to raise funds for product development and business processing by issuing new cryptocurrency. Token sales participants send as many cryptocurrency as they want to participate, and companies who conduct Token sales distribute a certain amount of Tokens to the participants. Q. What is the difference between Token sale, equity investment and donation? A. Equity investment acquires equity securities as much as the amount of investment and can receive dividends later, and donation can be handled through donation receipts (excluding non-specific donation amount). However, Token sale does not provide any form of share (dividend) or bond, and does not provide evidence of a document type such as a receipt. Q. What does mean by “Token” that receives through participating in Token sales? A. It is a new crypto-currency that would be paid for the amount of money participated in Token sales. Q. How much does the Token cost? Q. What is the minimum purchase amount? A. It should be transferred more than 1 Ethereum at least. Q. What is the USD ($) exchange rate? A. The USD exchange rate is calculated the closing sales basic rate of the previous business day of the deposit date, based on ‘KEB Hana Bank’. Q. How is calculated for the price of each payment currency, such as Ethereum(ETH), Bit-Coin(BTC), and Bit-Coin Cash(BCH)? A. The price for each payment currency is based on the closing price of the previous day (at 8:59:59 a.m. of the day) based on the ‘Upbit Exchange’. Q. Is it possible to participate with other coins than Ethereum(ETH), Bit-Coin(BTC) and Bit-Coin Cash(BCH)? A. Cryptocurrency other than Ethereum(ETH), Bit-Coin(BTC) and Bit-Coin Cash(BCH) cannot be allowed. Q. 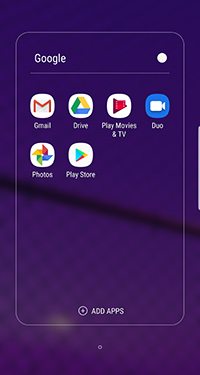 How can I purchase Ethereum(ETH), Bit-Coin(BTC) and Bit-Coin Cash(BCH)? A. You can purchase from the exchange you are using now. Please do not send it directly from the exchange wallet, but move it to your personal wallet first, and then send it to the correct address. Q. Can I get principal guarantee for the amount of participated money in Token sales? A. Token sales does not guarantee principal. Q. How much is the expected return on investment from the participation in Token sales? A. Token sales do not guarantee any form of return on investment. Token sales is the participation from individuals according to their own judgment, and the profit or loss from the change in Token price after participation is independent of the company. Q. Which digital wallet should be used to store my Tokens? A. It is implemented as an ERC-20 Token on the Ethereum block chain, and can be stored in various Ethereum based wallets such as MyEtherWallet, MetaMask. Q. What is the Hyperswap Wallet address that should be transferred by payment currency (Ethereum(ETH), Bit-Coin(BTC), and Bit-Coin Cash(BCH))? Q. . What if making a mistake and send the payment currency (Ethereum(ETH), Bit-Coin(BTC), or Bit-Coin Cash(BCH)) to the wrong address? Q. I sent it directly from the exchange wallet to my Hyperswap wallet address. What should I do? Q. What is the total supply volume of Tokens? Q. How is the sales revenue of the Token used? GBC Invest performs overall activities such as collecting detail information, conducting market survey, due diligence, acquisitions, accounting, management and reporting of assets operated in M & A transaction products and Asset Management. Since these managed assets are expected to require significant initial and subsequent financing needs, most of profits would be invested in M & A to provide maximum benefits to UCX users and buyers. One of the most important components of TechCoins’ project is the development of platform itself. The TechCoins platform has been made to reduce the cost of various financial transactions and asset management which is took place within our business model, and to maximize customer benefits. Therefore, it is very important to secure the necessary funds for build-up, utilization and consistent development of core distributed ledger technologies. 30% of the investment in platform development will be utilized to develop UCX, the infrastructure and user interface required for the exchange. As the case in all companies, some of the obtained funding will be used to recruit the best talent for company development and operation, and to train the talent for supporting existing members. 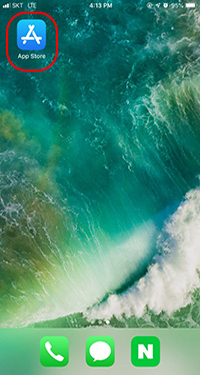 In addition, it will be used for general business operations such as legal consultation and other ICO promotion, marketing, advertising, management and operation for the company in order to comply with legal regulations in company management and to make appropriate legal action if it is necessary. Q. When is Token issued? A. When your registered KYC (Know Your Customer) is normal, it will approve within 3 days, and checks the deposit (transfer) to Hyperswap wallet address, then transfers purchased UCX Token and transferred history both to customer by e-mail within 3 days again, if KYC (Know Your Customer) is abnormal, we will send you relevant information to request re-registration. Q. When is it going to be listed? A. After the sale is completed, it is expected to be listed after discussing the listing schedule. Q. As interested in purchasing of Tokens. Where can I start? A. Please refer to the User’s Guide. Q. How can I contact for further information? A. When you contact to ucx@hyperswap.io, we will respond promptly after checking. Thank you. Please do not send directly from the exchange wallet. It will not be able to receive your purchased Token, if you transfer it from the exchange. Please enter your wallet address correctly. Tokens sent once cannot be reversed. Please contact ucx@hyperswap.io, in case you do not receive your UCX Token receipt within 10 days of transferring the payment currency to your Hyperswap wallet address.